The image shows velocity contours over a jet powered car designed to win back the land speed record set by the British Thrust SSC car in 1997. The design was developed by Bill Fredericks, who designed the Budweiser Rocket Car that broke the sound barrier in 1979. 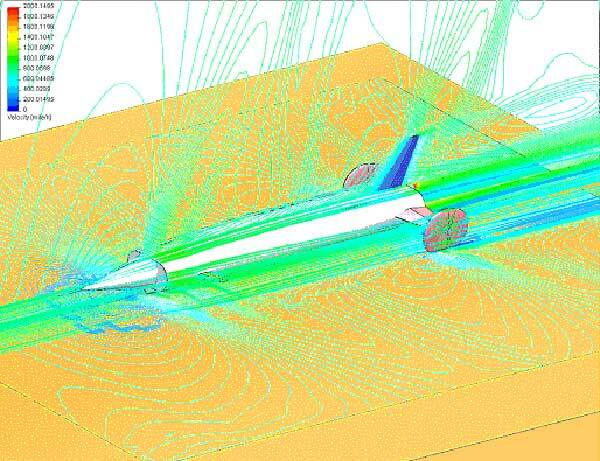 The flow around the car was simulated using a commercial finite element code, Floworks. This simulation involves the solution of the three dimensional, steady, compressible Navier-Stokes equations with Newtonian viscosity. The computational domain was chosen to simulate the environment as closely as possible and to make the boundary conditions, especially the problematic ground boundary condition. This simulation led to a number of improvements in the vehicle design. Flometrics provides R&D and engineering services to the aerospace, semiconductor, medical devices and consumer products industries. Two spin-offs over the years are our Rocket Fuel Pump technology and Chilldyne liquid cooling solutions for data centers.